We are Jaunts and Gems, LLC. and we look forward to the opportunity to act as your booking agent for your travel needs. Access to and use of the services of Jaunts and Gems, LLC and our website is subject to acceptance of these terms and conditions (“Terms and Conditions”). By accessing, using or obtaining any content, products, or services through our offices or through our website, you, the purchaser and/or traveler (“Customer” and “passenger” and “you/your”) agree to be bound by these terms. PLEASE READ THE TERMS BEFORE USING THIS WEBSITE. IF THERE IS ANY PART OF THESE TERMS AND CONDITIONS YOU DO NOT AGREE WITH, PLEASE DO NOT USE THIS WEBSITE OR THE SERVICES OF JAUNTS AND GEMS, LLC. No alterations to these terms and conditions may be made by any Jaunts and Gems, LLC employee, authorized representative or agent, unless in writing by an authorized officer of Jaunts and Gems, LLC. Price quotes for travel are not guaranteed until reservations are confirmed with full passenger names and deposit payment. Quotes on airfare are not confirmed until paid in full and can change without notice. All prices are subject to change without notice and are subject to availability. Unless otherwise noted, price quotes typically do not include airfare, baggage fees, gratuities, meals, telephone calls, resort fees, incidental items, souvenirs, airport transfers or travel insurance. Peace of Mind Travel Services works with many travel operators who will match prices. However, each component must be the exactly the same in the quote. It's better to communicate with us about your research efforts from the beginning so we're able to assist you in making an informed decision. Not all less expensive quotes are good investments. Working with a travel agent is more beneficial than not working with one for various reasons. Effective MARCH 1, 2018 – In order to perform the professional services required to start your travel inquiry, a Travel Service Fee is required. The Travel Service Fee is a non-refundable & non-transferable administrative fee and is separate from the total trip cost. rice and availability is not guaranteed and is subject to change until a deposit is submitted by the client by the deadline deemed by the vendor. ith each Travel Service Fee, the client will receive three (3) proposals for the same destination and desired travel dates. Quote revisions & requests for a different destination is subject to an additional Travel Service Fee of $25. If the client decides to not book with Jaunts and Gems, LLC for any reason, Jaunts and Gems, LLC has the right to retain the Travel Service Fee. No exceptions will be made. * Travel Service Fee is subject to change based on the complexity of the itinerary and at the discretion of management. Speak with your Travel Concierge for pricing. **There is no Travel Service Fee charged for trips hosted by Jaunts and Gems, LLC. Unless otherwise defined during the reservation process, final payment is due prior to departure or consumption in accordance with each supplier’s (airline, hotel, cruise line, transfer company, sightseeing operators, and other travel service vendors) terms and conditions involved in your travel booking. With advanced planning (6 months or more), a flexible monthly payment plan is available for ALL vacation packages. An automatic monthly payment feature is also available for your convenience at no additional cost. There is a minimum monthly payment of $100, unless otherwise noted in the quote and/or agreement. Reservations paid after the due date of scheduled payment plan &/or final payment due date will be charged a late payment fee of $25.00 per person. The late fee is not applied to your reservation and does not reduce the amount of your balance. Payments that are 7 days past the due date & Hosted Trips with no payments 45 days from the initial deposit will be cancelled automatically with NO REFUNDS and deposits shall be forfeited. NO EXCEPTIONS! All late payment requests must be approved by management before the final payment deadline on your account. If a late payment is approved and your approved date is after your final deadline, the $25 late fee will still apply. If final and full payment is not received by the applicable due date(s), reservations are subject to cancellation and deposits shall be forfeited. In some cases, there is NO REFUND after the final payment. Your right to a refund if you change or cancel your travel plans is limited. All cancellation requests must be sent to Jaunts and Gems, LLC in the form of: 1. Email or 2. Cancellation Request Form. As a result of cancellation, Travel Service Fees and third party supplier’s cancellation penalties will apply, which are detailed in your travel documentation, each supplier’s websites and www.jauntsandgems.com. Cancellation penalties are advised at time of booking and provided to you upon confirmation. If you have any questions, or any penalties are unclear, please contact Jaunts and Gems, LLC. Cancellation fees will be charged to the credit card you authorized to pay for travel services. Jaunts and Gems, LLC Fees are separate from Vendor Cancellation Fees. Vendor policies regarding cancellation fees will be relayed to all clients in your trip quote documents. If you cancel, your cancellation fee will be $25 per person + the Vendor’s Fee, if applicable. If you decide to change any portion of your confirmed arrangements prior to departure or during your trip, we will attempt to assist you. Due to Vendor(s) policy(ies) or time restraint(s), certain bookings may not be changed. Administrative charges of $25 or more per change/per person are advised at time of booking, provided to you upon confirmation, and depend upon circumstances of the request. All desired changes must be sent via email to Jaunts and Gems, LLC. Changes will not be processed until the $25 administrative charges have been received. *Airfare is non-refundable after booking. Travel insurance is strongly recommended. It may be purchased, which may cover cancellation for covered reasons as outlined in the insurance policy. Insurance policies vary with differing exclusions (such as pre-existing conditions, work related issues, supplier bankruptcy, change of mind, etc.). Photo identification is required for all travel. Passports are required for international travel and some countries require a visa. Passports are required to be valid for at least 6 months after the date of travel. Some countries require a full blank “VISA” page in the passport for stamping purposes. Any information provided on travel description pertains to US citizens only. Travelers will not be permitted to depart without the proper identification. It is the traveler’s responsibility to verify and obtain any required identification prior to travel commencing. Please check with you U.S. Department of State for more information related to your travel destination. Special documentation is required for minor children traveling with or without their parents. If traveling with children, please check with the supplier before departure for any specific policies or restrictions. Non U.S. citizens must contact the consulate of any countries you are visiting to verify any visa requirements. Non – U.S. citizens residing in the U.S. must also contact the U.S. Citizenship and Immigration Services for re-entry requirements into the U.S. It is important that you confirm your flights with the airline prior to departure: 24 hours in advance for domestic flights, and 72 hours in advance for international flights. Failure to confirm international flights or failure to use any portion of an airline reservation may result in automatic cancellation by the airline for all continuing and return flights. Familiarize yourself with your airline’s policies and requirements before booking. Unless stated otherwise by the airlines, it is important to arrive at the airport at least 2 hours prior to departure for domestic flights and 3 hours prior to departure for international flights. Late arrival at the airport can result in loss of assigned seats or denial of boarding. Denial of boarding is not eligible for refund or travel insurance reimbursement. Airfare rebooking is subject to airline penalties, rebooking fees, plus any cost difference of the new flight. Seat assignments are subject to change by the airline without notice. All prices are thought to be accurate, available, and current. The information, products, and services may include inaccuracies or typographical errors. Jaunts and Gems, , LLC does not guarantee the accuracy of, and disclaims liability for inaccuracies, including by not limited to the price, information, and description of the products and services described on this website. Jaunts and Gems, LLC is not liable for any errors made by the client creating their own bookings online. By booking online clients take full responsibility for any errors that may occur (name misspellings, incorrect travel dates, etc.). Jaunts and Gems, LLC is not liable for the acts, errors, omissions, representations, warranties, breaches or negligence of any supplier, or personal injuries, death, property damage or other damages or expenses resulting from causes outside of the control of Jaunts and Gems, LLC.  Jaunts and Gems, LLC shall not be responsible for travel delays or cancellations or any illness, death, injury, damage or loss of vacation time arising there from. Changes to cruise ports of call or itineraries due to mechanical, weather, or world events beyond our control are at the sole discretion of the cruise line and may occur without notice. Any applicable compensation resulting from such occurrences is also at the sole discretion of the supplier. Jaunts and Gems, LLC shall not be liable for any injuries, damages, or losses incurred by the traveler in connection with, or by supplier employees or contractors, terrorist activities, social or labor unrest, mechanical or construction failures, or difficulties, diseases, local laws, climatic conditions, criminal acts or abnormal conditions or developments, or any other actions, omissions, or conditions outside of the control of Jaunts and Gems, LLC. The Traveler assume the complete and full responsibility for checking and verifying any and all passport, visa, inoculations, or other entry requirements for each destination as well as re-entry into the U.S., and all safety or security conditions at such destinations, in connection with the proposed travel. For information concerning possible dangers at international destinations, check the Travel Advisory Section of the U.S. Department of State website.